TEACHERS. Calling all Art, Design and any other educators who might be interested… I’ve added a couple art resources free for download. (And if you like them and would like me to keep making more- feel free to click on the “donate” button.) These resources will be found in the right sidebar on my blog. PLUS- I’m offering 20% discount on stamp kits (exclusively from my website) for teachers who want to add a bit of creative play to the classroom. Both of the resources I’m providing will compliment the Make a Scene Stamp Kits. The purpose of this presentation is to share a bit of the history of Dutch Canal Houses. Students will also learn about some of the unique architectural characteristics, which can be used as inspiration in many art projects. For lesson ideas, visit my blog. Would you like to share a real-world design process with your students? As an educator myself, I thought students might like to see a behind-the-scenes process of how I created my stamp kit. Send me your questions, comments and feedback. I’d love to see what you design! Download the free Make a Scene Stamp Kit Design Resource for your design lessons. Teacher Discount on Stamp Kits! 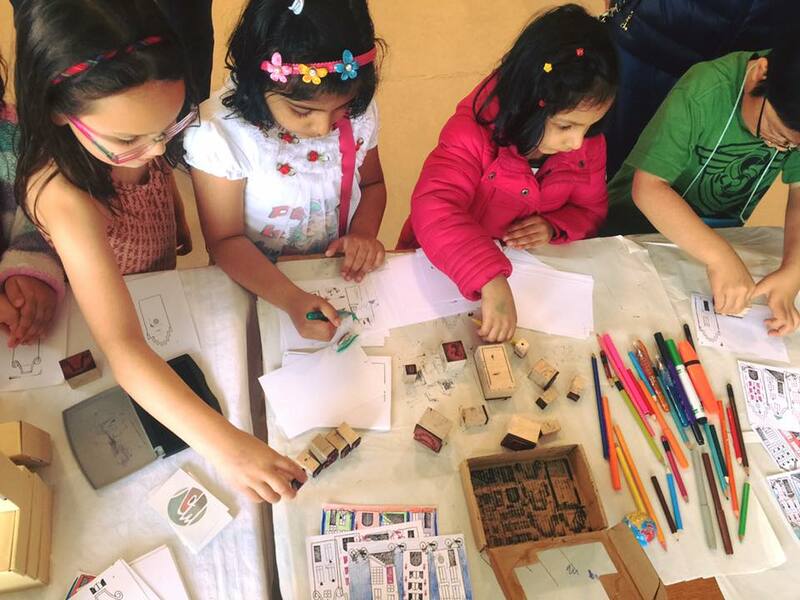 Kids of all ages love the Make a Scene Stamp Kits- and they are great for creative play. Contact me for a quote! This offer is only valid from this website. The bigger the order, the bigger the discount, while supplies last. UK/ NL orders will be processed via bank transfer, all other orders will be processed via Paypal. Do you teach design in the classroom? Get your FREE downloadable resource to show your students how I used the design cycle to make these stamp kits. I welcome questions and feedback from students! Stamp kits now available at Room 21 in Den Bosch. Delighted to add The Gift Lab to my list of Amsterdam stockists. Stamp kits now available at Locals in Amsterdam! Now Selling at It’s a Present! ‘It’s a Present’ is a very cool two story gift shop in the legendary Nine Streets shopping district of Amsterdam and they are now selling my Make a Scene Stamp Kits!